It's the Little Things. . .: SEVEN MONTHS AGO???? I can't believe it's been that long ago that I created my blog. I got it all set up with plans to update it on a regular basis and LIFE just seemed to get in the way! It's now Spring in Minnesota! The trees have all leafed out and my perennials are growing bigger and bigger each day! The huge lilac bush in my backyard has hit it's peak. The blooms are already starting to fade as well as the heady scent they once carried. The Dianthus is starting to bloom. And my peonies are getting tall with lots of buds. Since my last post, our granddaughter, Harmonie, turned six! Our grandson, Liam had his first birthday and is now 17 months old! 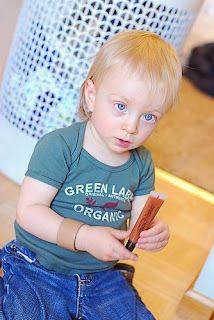 Liam emptied Mom's purse and found her "Hot Chocolate" flavored lip gloss! And we welcomed the newest addition to our family, Isabelle ("Izzy"), in February. Customer quilts have been keeping me pretty busy the last few months. I recently had to take my APQS Millennium head down to the manufacturer in Iowa for a "tune-up"; only to find out I had some major repairs -- new motor, new wheels, new needle bar, etc. After being without my machine for nearly a week, I'm happy to say we're back up and running and she runs like a brand new machine! I just want to say "Thanks" to my sister, Sue who introduced me to "blogs". I can't believe how "addicted" I am . . . you know, it starts with one blog and then you start looking at their "Favorites" and then the "Favorites" for their blogs . . . and it just spirals until you can't remember the name of the first blog you were originally reading! My latest discoveries have been people like "The Nester" at The Nesting Place, Edie at Life In Grace, Rhoda at Southern Hospitality and Layla at The Lettered Cottage. These ladies, as well as many others, have truly inspired me! I've gleaned a lot of wonderful, and inexpensive, decorating ideas from all of these sites and will share some of them in future posts. Hey Sis...I'm the first to comment!!! You did it, little sis! I'm so proud of you - the first blogger in our family! I'll be a faithful follower. Love you. Memorial Day and Bargains Galore!